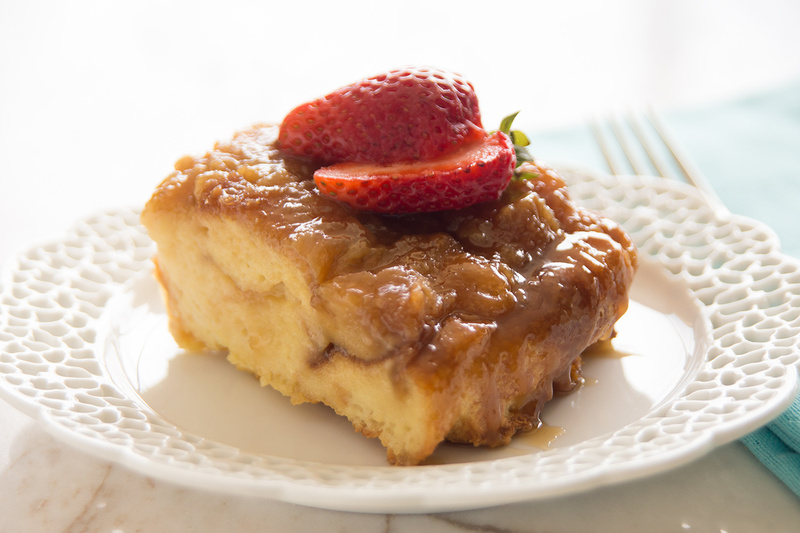 The delicious flavors of Creme Brulee baked into an old fashioned bread pudding. Combine butter, brown sugar and corn syrup in a small sauce pan. Cook over medium heat, stirring often. Simmer until smooth and bubbly, about 5 minutes. Pour mixture into sprayed 9×13 inch baking pan. Add bread cubes on top of the brown sugar mixture and press down slightly. In another bowl, whisk together eggs, milk, cream, vanilla and salt. Pour over bread cubes. Cover with plastic and refrigerate a few hours or overnight. Take out of fridge and let come to room temperature. Remove plastic and bake at 350 degrees F 35-40 minutes. Carefully invert onto serving tray or baking sheet. Serve warm with strawberries, if desired. Can I use day old bread rolls? Day old rolls should work great with this recipe.